Looking for a fun party theme idea? How about a gathering inspired by The Wonderful Wizard of Oz? With the new Oz, The Great and Powerful movie out, and a new animated Dorothy of Oz coming soon, it’s a great time to take a trip to the Emerald City and plan a fun get-together. Find everything you need to make an unforgettable party in Everything Oz – a fabulous book and guide by Christine Leech and Hannah Read-Baldrey. Bright, brilliant and fun, the book boasts 50 Oz-inspired projects to wear, eat, drink or display. The book starts with a brief history of Oz, jumps into some craft and cookery essentials, then takes you on a fun crafting, baking, making and mixing journey. You’ll find everything from party invitation ideas (flying monkeys, anyone) to Munchkin placecards, Ruby Slippers to Dancing Scarecrows. 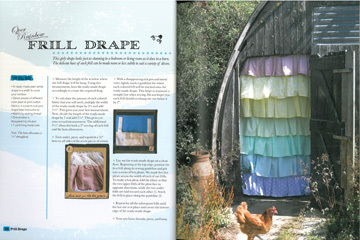 One of my favorite craft ideas was this frill drape. I can picture it in place of a closet door or used as a shower curtain. The step-by-step directions are included. There are also numerous fun recipes, like Squashed Witch Cupcakes, Over the Rainbow Cake, and Baum’s Buttons. 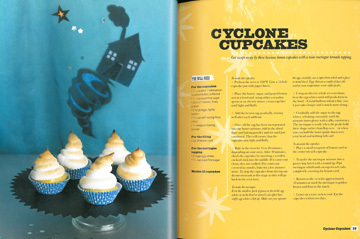 I thought this idea for Cyclone Cupcakes was so clever and yummy! If you’re thinking about hosting an Oz-themed party, make this book part of your planning. With all the great ideas, you can’t go wrong choosing a handful to share with your family and friends! From Chicago Press Review, the book retails for $24.95 and is available online at ipgbook.com. I did also find it on Amazon.